Today the developing countries are highly dependable of processed food and industries are streamlined and automatic food fortification has played major role in the health of the population at large. It provides the immense benefits provided by adopting efficient precious methods. The micro-nutrient fortification of food can be employed effectively by means of adopting precision mixing for cereal flours and their products, milk powder and powder beverages etc. Precision Mixing : The fluidized zone mixer is +99 percent efficient and produces extremely hematogenous mixtures. It has successfully blended additives in proportions as low as 2 parts per million. It has also mixed vitamins in mil powder at proportions of 1000 parts per million with good results. Normal mixing times range from 30 to 60 seconds and are achieved with a very low peripheral speed – the mixing action is very low shear. This result in less segregation and no friction generated heat. Building structure to keep the machine in place. Today electricity boards are demanding minimum deposit based on total load of plant plus minimum charges towards power supply irrespective of using power or not. The design of our mixer is such that 60% of the material is in fluidized state and hence the motor rating is considerably reduced. The energy consumption per ton of mix is very low due to mechanical fluidized zone mixing and short mixing time. The spare parts consumption is a function of speed, time and power put into the mixer. Forberg Mixer has a very low rotation speed, short mixing time and low power input. Hence the spare parts requirement is greatly reduced. Since the Mixer is slow rotating machine with full protection of the bottom, the wear and tear is very limited. Hence the life time of the machine itself will then be very long, which again protects the customer’s investment. Due to short mixing time you can have high capacity output. 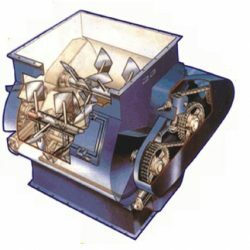 The mixer are equipped with relatively small capacity motors. Hence the total weight of the system is very modest. Due to slow rotation there is no vibration in the machine. Moreover the two shaft system has counter rotating shaft, which completely eliminate stress on the construction itself. The sum of these features is reduced construction and maintenance costs. Since weight of the machine is very less and also vibration is less due to balancing factor of two shaft contra rotating system which ultimately reduces the cost of building structure to keep the machine in place. Fortification of wheat flour by iron and flour improving agent is essentially required at milling industries to enhance the enrichment of the same to compensate it losses during the process. Iron / Iodine Fortification of salt has to meet stringent technical requirement, Also the addition of food stabilizer and anti caking agent in a very smaller proportion realy demands precision mixing equipment. Hence the new generation Toshniwal Mixer is an absolute choice for the above said application for efficient precision mixing to the benefit of the people for better health by fortification of food by means of Toshniwal Mixer.